At 1000 UTC today, Groupama 4 (Franck Cammas/FRA) maintained a 51-nautical mile (nm) ead over PUMA's Mar Mostro (Ken Read) after the French team pulled off a demanding night time gybe at latitude 58 degrees south, their first manoeuvre in over a week. PUMA Ocean Racing powered by BERG, who reached 59 degrees south -- just shy of the ‘screaming sixties’ -- followed suit, with the teams taking around two hours to complete a move that is not easy to achieve safely during daylight in heavy conditions, and is much more difficult and dangerous at night. Meanwhile, still in third position and 363.3 nm behind, the damaged Telefónica (Iker Martínez/EPS) has also altered course and will round Cape Horn carefully before heading into the Argentine port of Ushuaia (Tierra del Fuego), where the team will make a pit stop in order to repair damage to their bow section. “We are able to sail quite well, but we don’t want to go faster, because we are afraid of having more damage,” said skipper Iker Martínez. 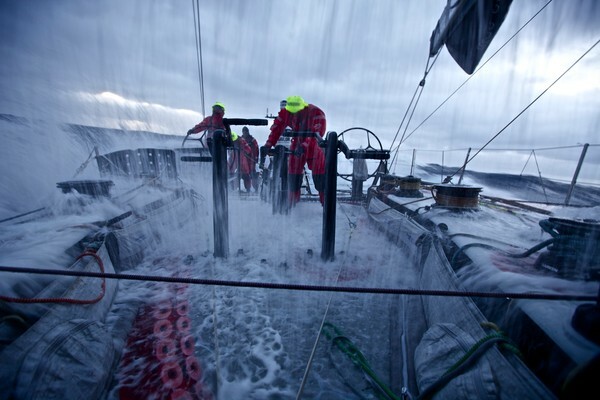 "We are just trying to keep sailing and making miles to the Cape." The team are confident repairs can be made quickly and they will return to the racetrack to complete Leg 5. However, although the boat is holding up well, there are still over 3,000 nm to the finish in Itajaí. “Something worse could happen – things can always go wrong,” the skipper said. While speeds for the leading pair are around 19 knots, Telefónica are maintaining a steady average of 16.3. Further back in fifth place, Ian Walker and Abu Dhabi Ocean Racing are racing hard to make up their 1,396 nm deficit and the team are enjoying every minute of it, having been starved of true Southern Ocean conditions up until yesterday. “Not only have we finally joined the war in the Southern Ocean, but we just hit 40 knots while surfing down a wave,” wrote Media Crew Member Nick Dana. The boat is averaging 23-24 knots with one reef in the mainsail and the J4 headsail set. Overnight, the crew were on deck ‘hooting and hollering’ at whoever was at the helm, geeing them on for a good shot at the next wave. “The boat is handling fantastically – this is the first time we have really had her in this kind of situation and everyone is very pleased,” Dana concluded. The forecast predicts the team will stay with the depression for at least 24 hours, which will provide 25-30 knots of breeze with a following sea. “We’re pointed right at the barn door and we should tick off the miles nicely now,” Dana says. CAMPER with Emirates Team New Zealand (Chris Nicholson/AUS) are in light airs 1,069 nm behind Groupama as they sail a different course towards Puerto Montt on the western coast of Chile, where they plan to repair the boat and return to complete Leg 5. They too have been gybing to maintain a good direction, planning to position themselves as best they can to make it through the approaching depression, which will bring 30 knots of wind. The crew of Sanya (Mike Sanderson/NZL) have been packing down the race boat ready for shipping to Savannah in the United States tomorrow. They will re-join the fleet in Miami.